Donald J. Trump thwarted the projections of pollsters and analysts late last night with a stunning victory that saw him elected the 45th President of the United States. In the hours since, world reaction has been pouring in and there is plenty of shock and concern to go around. “The world gasped in collective disbelief on Wednesday following the victory of Donald Trump in the US presidential race, with apprehensive allies seeking to put a brave face on a result they had dreaded and American adversaries exulting in an outcome they see as a potential turning point in global affairs,” said an early item from The Washington Post. Reaction has been equally swift within the sphere of international education, and there is considerable commentary from educators and students alike so far. 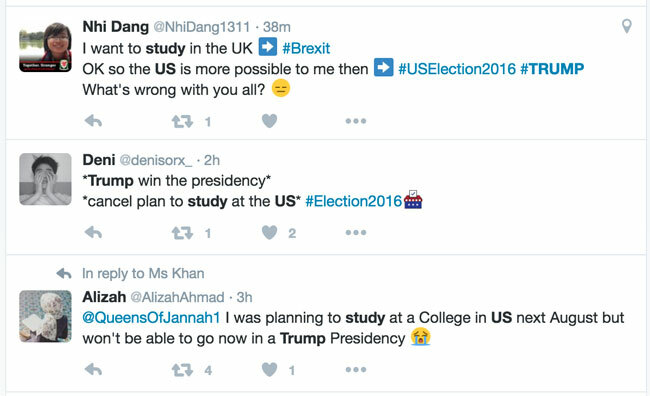 Even a cursory pass through a major social platform like Twitter – as the following sample illustrates – suggests that the election result could well influence foreign students’ plans for study in the US. A representative sample of international student commentary retrieved from Twitter on 9 November 2016. The immediate question that rides along with such commentary is whether this simply reflects a more immediate emotional response to an unexpected result, or whether it foreshadows a more durable shift in student perception. As we explored recently, popular perceptions of the attractiveness of study destinations have been shown to have important effects on student mobility, particularly around widely covered events reflecting the political climate of a destination or issues of student safety or security. In the specific case of the US presidential election, recent surveys have indicated that significant percentages of prospective students would be less likely to study in the US following a Trump victory. For additional background on the potential fallout for international student mobility in the US and the country’s international competitiveness, please see “Power of perception: How the US presidential race could impact student recruitment”. This entry was posted in North America, Regions, United States and tagged student mobility, undergraduate student recruitment, USA universities, study abroad, study in USA.